We also do kitchen mixer repairs if you are willing to bring your item to our location nearest the Waterloo area to be repaired. We provide diagnostics for each and every service we perform. Not just that, we also offer condo appliance repair services in Waterloo surrounding areas as well! We have strategically placed all of our technicians throughout Waterloo and surrounding areas so that there is always a technician in the area, ready to repair any malfunctions you are having! The Alex technicians provide same-day service and are available during evenings, on weekends and even on holidays! If you live in the Waterloo area and are looking for a quick, hassle-free appliance repair service you should consider calling Alex Appliances. At Alex Appliances we ensure that our technicians are highly skilled and have years of experience. Not just that, we also make sure each of our technicians are trained properly so they can identify the problem quickly and get your appliance(s) back up and running in the shortest time possible! That is the Alex advantage North York Nobleton Newmarket! Is your fridge too warm, too cold, sweating or dripping pools of water? We’ve seen all this before – and more. With our multi-stocked repair vehicles and trained personnel, your fridge can be working properly again before the ice has time to melt! Call Alex Appliances today for fast and effective fridge repairs in Waterloo. Alex Appliances is ready to serve you all over Waterloo for all your fridge repair needs. Life can be very difficult for any family without a fridge. This is why Alex Appliances carries lots of replacement fridge parts in our vans to ensure that your fridge can be good as new. Call Alex Appliances today for all fridge repairs! Is your clothes washer blowing bubbles, or not spinning as you would like? Alex Appliances Waterloo technicians know all the diagnostic tricks in the book and come prepared with all the spare parts they need to make the repairs on the spot. If your washer is giving your problems and you are looking for same day service, call Alex Appliances today. Is your dryer nor turning? Or perhaps it leaves your clothes still damp? Our technicians will soon find out what is wrong and will have your dryer working again in the shortest possible time. We always arrive equipped with the most common replacement parts so will probably be able to carry out the repair in just one visit. Call Alex Appliances for all your Waterloo dryer and other appliance repair needs. Does your dishwasher not drain? Or do the plates not get clean?We can diagnose what ails all makes of malfunctioning dishwashers and carry the spare parts with us that will get them back up and running in no time at all. For reliable Waterloo dishwasher and other appliance repairs, call Alex Appliances today and enjoy our same day service. Does your stove not want to heat up or is it charcoaling your food? Don’t go hungry – call Alex Appliances today and we’ll send one of our team of Waterloo technicians to carry out a same-day stove repair. We bring all the spare parts we need for the most common stove malfunctions so will probably be able to resolve your problem in just one visit. Call Alex Appliances today to set up your same day Waterloo stove repair appointment. Is your roast chicken not roasting? Or the cheese on your gratin just won’t melt. Why not call Alex Maple Appliance repair technicians to come and take a look. Our trained personnel are very familiar with all the main brands of oven and carry hundreds of replacement parts in their repair vehicles. So don’t put it off – call us today and ask about our same-day Waterloo oven repair service. Waterloo is a city in Southern Ontario, Canada. It is the smallest of the three cities in the Regional Municipality of Waterloo (and previously in Waterloo County, Ontario), and is adjacent to the city of Kitchener. 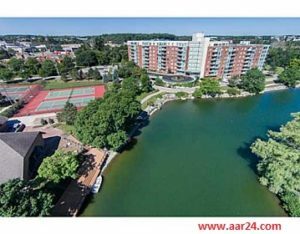 Kitchener and Waterloo are often jointly referred to as “Kitchener-Waterloo”, “KW”, the “Twin Cities” or “the Tri-City”. (When the reference includes the city of Cambridge, Ontario, the term Tri-Cities is used.) Years ago, there had been several attempts to combine the two cities into one but they were not successful. After 1973, when the Regional government was formed, there was less motivation to do so. At the time of the 2016 census, the population of Waterloo was 104,986. In 2016, MoneySense rated Waterloo as the tenth best place to live in Canada. Waterloo started on land that was part of a parcel of 675,000 acres (2,730 km2) assigned in 1784 to the Iroquois alliance that made up the League of Six Nations. The rare gift of land from Britain to indigenous people took place to compensate for wartime alliance during the American Revolution. Almost immediately—and with much controversy—the native groups began to sell some of the land. Between 1796 and 1798, 93,000 acres (380 km2) were sold through a Crown Grant to Richard Beasley, with the Six Nations Indians continuing to hold the mortgage on the lands. The first wave of immigrants to the area comprised Mennonites from Pennsylvania. They bought deeds to land parcels from Beasley and began moving into the area in 1804. The following year, a group of 26 Mennonites pooled resources to purchase all of the unsold land from Beasley and to discharge the mortgage held by the Six Nations Indians. Many of the pioneers arriving from Pennsylvania after November 1803 bought land in a 60,000 acre section of Block Two from the German Company which had been established by a group of Mennonites from Lancaster County, Pennsylvania. The Tract included most of Block 2 of the previous Grand River Indian Lands. Many of the first farms were least four hundred acres in size. The German Company, represented by Daniel Erb and Samuel Bricker, had acquired the land from previous owner Richard Beasley; he had gotten into financial difficulties after buying the land in 1796 from Joseph Brant who represented the Six Nations. The payment to Beasly, in cash, arrived from Pennsylvania in kegs, carried in a wagon surrounded by armed guards. In 1816 the new township was named after Waterloo, Belgium, the site of the Battle of Waterloo (1815), which had ended the Napoleonic Wars in Europe. After that war, the new township became a popular destination for German immigrants. By the 1840s, German settlers had overtaken the Mennonites as the dominant segment of the population. Many Germans settled in the small hamlet to the southeast of Waterloo. In their honour, the village was named Berlin in 1833 (renamed to Kitchener in 1916). Berlin was chosen as the site of the seat for the County of Waterloo in 1853. By 1869, the population was 2000. Waterloo was incorporated as a village in 1857 and became the Town of Waterloo in 1876 and the City of Waterloo in 1948. Waterloo’s city centre is located near the intersection of King and Erb streets. Since 1961, the centrepiece has been the Waterloo Town Square shopping centre, which underwent a thorough renovation in 2006. Much of the mall was torn down and has been replaced by buildings that emphasize street-facing storefronts. Residents refer to the Waterloo city centre as “uptown” (often capitalized), while “downtown” is reserved for the Kitchener city centre, as Kitchener had been the dominant centre, and Waterloo was a small town on the KItchener’s north side. 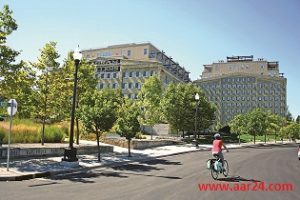 Waterloo surged into a significant City in the middle of the 20th Century, due in large part to its role as a college town. It has also benefited with the growth of Insurance companies. 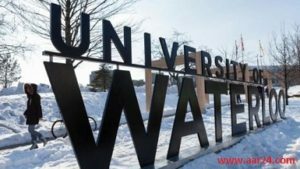 Waterloo has prospered with the relationship between the Tech Sector, which has blossomed, and the University of Waterloo whose technology graduates have excelled. Blackberry, formerly Research In Motion, is the best example. The city centre was once along Albert Street, near the Marsland Centre and the Waterloo Public Library. The town hall, fire hall, and farmers’ market were located there. Amidst some controversy, all were demolished between 1965 and 1969.